From the author of The Perfect Storm, a gripping book about Sebastian Junger's almost fatal year with the 2nd battalion of the American Army. 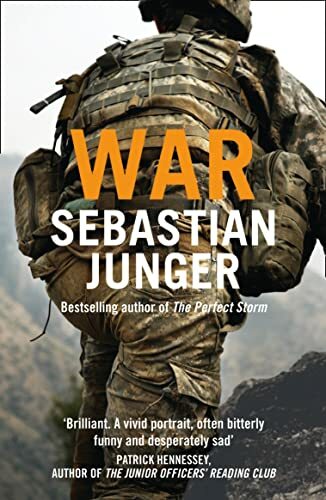 From the author of The Perfect Storm, a gripping book about Sebastian Junger's almost fatal year with the 2nd battalion of the American Army. For 15 months, Sebastian Junger accompanied a single platoon of thirty men from the celebrated 2nd battalion of the U.S. Army, as they fought their way through a remote valley in Eastern Afghanistan. Over the course of five trips, Junger was in more firefights than he could count, men he knew were killed or wounded, and he himself was almost killed. His relationship with these soldiers grew so close that they considered him part of the platoon, and he enjoyed an access and a candidness that few, if any, journalists ever attain. But this is more than just a book about Afghanistan or the 'War on Terror'; it is a book about the universal truth of all men, in all wars. Junger set out to answer what he thought of as the 'hand grenade question': why would a man throw himself on a hand grenade to save other men he has probably known for only a few months? The answer is elusive but profound, and goes to the heart of what it means not just to be a soldier, but to be human. `War' is a narrative about combat: the fear of dying, the trauma of killing and the love between platoon-mates who would rather die than let each other down. Gripping, honest, intense, it explores the neurological, psychological and social elements of combat, and the incredible bonds that form between these small groups of men.